Government responses to a major natural disaster are structured a bit like a three-act play, but in reverse — instead of building toward a climatic final act, the pace of recovery slows as it moves from one stage to the next. In the case of Hurricane Harvey, Act I began last August when a flotilla of first responders and volunteers rescued thousands of people trapped in flooded buildings. Over the ensuing days and weeks, officials distributed emergency supplies, organized shelters and assessed the monumental task that lay ahead. Act II, the short-term recovery, continued for months as the Federal Emergency Management Agency processed applications and doled out grants for temporary home repairs, rental assistance, motel stays and other services. Hundreds of thousands of people got help. Nine months after Harvey, state and regional leaders have shifted their attention to Act III, long-term recovery. It’s sure to continue for years. Gov. Greg Abbott announced plans in April to allocate $5 billion provided by the U.S. Department of Housing and Urban Development for rebuilding and mitigation projects. And weeks later, Harris County officials announced a $2.5 billion bond election to pay for projects intended to protect the region from catastrophic flooding. As easy as it is to “progress” on paper, many Southeast Texas residents are still stuck in Act II. 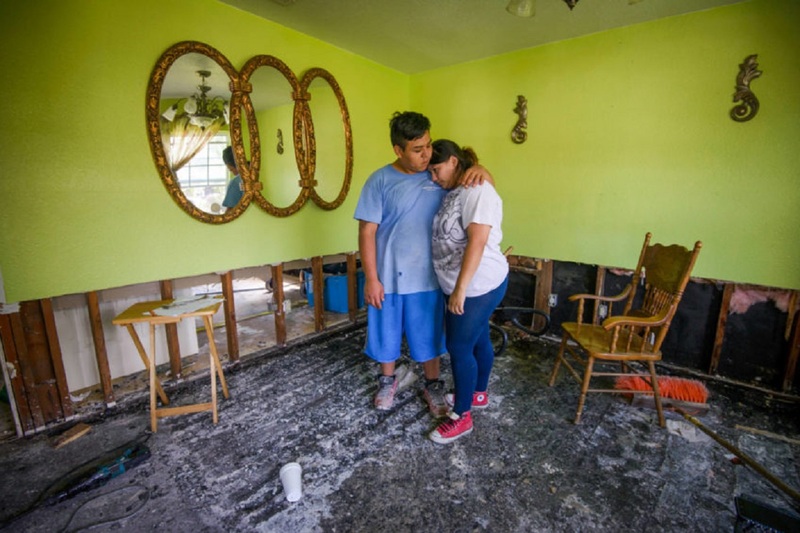 One Houstonian, Teresa Hernandez, is still living with her husband and four kids in a damaged rental home that flooded during Harvey. Part of her roof collapsed during the storm, and the home took on so much water that a FEMA inspector later deemed it uninhabitable. The family got rental assistance for two months, but nothing after that. They’ve racked up credit card debt because of storm-related expenses, and mold is growing in the home. “We’re worried because there’s been no help,” Hernandez said. Hernandez sought assistance at a “restoration center” in Pasadena operated by the city of Houston and BakerRipley, a nonprofit community development organization. It’s one of 12 such centers around the Houston area, funded in part by the Hurricane Harvey Relief Fund, a private effort administered by the Greater Houston Community Foundation that raised more than $101 million. A visit to one of these centers makes clear that many of those affected by Harvey still need help with basic issues such as making their homes safe to live in and replacing furniture or clothing ruined by floodwaters — the kinds of problems covered, theoretically, in the second phase of assistance. Many residents of neighborhoods near the campus are reluctant to seek government help because of their immigration status. For the most part, FEMA cannot provide assistance to those in the country illegally, but the presence of a legal resident in a household — typically a child born in this country — can qualify a family for some help. The Harvey assistance managed by BakerRipley and other nonprofits, funded with private donations, is not subject to the same restrictions. And BakerRipley, which provides a wide range of services at its Gulfton campus, is deeply embedded in the community. “Word of mouth and trust is the best strategy,” said Mac Naught. As she spoke, children scampered around her legs or clutched the hands of parents waiting to be interviewed by case managers who would assess their needs. After the intake process, clients left the center with brown paper bags filled with donated items such as clothing, children’s toys or cleaning supplies. After months of struggling on their own, those seeking help for the first time often are coping with high levels of stress. Counselors assist them with strategies such as deep breathing techniques, and many take comfort in meeting others facing similar struggles.